Gina Seymour is the library media specialist at Islip High School. 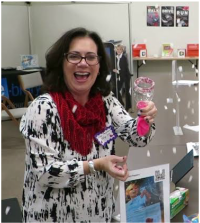 She is the recipient of SSLMA School Librarian of the Year (2014) award, and has presented on a variety of technology related topics and provides professional development opportunities. Gina serves on the ALA's Website Advisory Committee and is Chairperson for YALSA’s Website Advisory Committee. She is an Adjunct Professor at St. John’s University (Queens, NY), Department of Library and Information Science. Kristina Holzweiss is the school library media specialist at Bay Shore Middle School, as well as a presenter, author, and professional developer. In 2015, she was named the School Librarian of the Year by School Library Journal and Scholastic. She also received the Lee Bryant Outstanding Teacher Award by NYSCATE and the Fred Podolski Leadership and Innovation in Technology Award by the Long Island Technology Summit.